Nissan Qashqai Performance, Engine, Ride, Handling | What Car? We reckon the entry-level 138bhp 1.3-litre petrol engine is the best choice for most buyers. Outright acceleration is brisk enough, but it is this engine’s flexibility – the ease with which you can build speed from low revs in any given gear – that really impresses. It’s so good, that the 158bhp version of the same 1.3-litre engine doesn’t seem worth the extra outlay. That is, unless you tow a caravan; the extra oomph could prove useful. You’ll also need to choose the more powerful engine if you want an automatic gearbox – you can’t have one with the 138bhp version. The 113bhp 1.5-litre diesel is worth a look if you’re a high-mileage driver. It isn’t particularly quick but delivers its power smoothly. It’s also pretty gutsy from low revs, so it never feels frustratingly tardy. A 148bhp 1.7 diesel will soon join the range and will be the only variant available with four-wheel drive. We’ll let you know what it’s like when we’ve tried it out. If you need an automatic gearbox, you’ll be impressed by the responsiveness of the 1.3-litre’s optional dual-clutch ’box; it reacts quickly to prods of the accelerator and invariably finds the right gear for your needs. Meanwhile, the Qashqai’s manual gearbox has quite a long throw and doesn’t snick into gear as sweetly as the Seat Ateca’s, although the light action of the shift means very little elbow grease is required. Qashqai ride quality depends a lot of the size of the wheels fitted. On the smallest 17in rims – standard on Visia and Acenta Premium models and optional on the posher trims – all is reasonably smooth. Road scars and potholes are dealt with adroitly in town and things stay neatly controlled at motorway speeds; it’s certainly a more supple ride than you’ll experience in the Seat Ateca, but the rival Skoda Karoq is an even more comfortable. Move up to 18in wheels (standard with big-selling N-Connecta trim), though, and ride quality suffers. 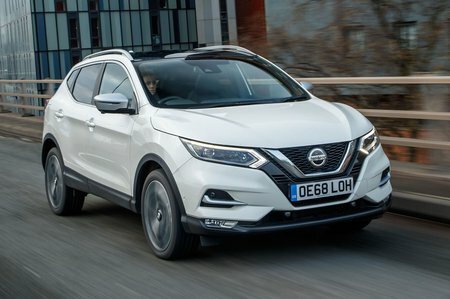 Thus-equipped, the Qashqai jostles you around on imperfect roads and isn’t especially settled on the motorway, either – even compared with the sportier Ateca. A real word of warning, though: the ride is too firm and unsettled if you go for a Tekna model with its standard 19in wheels – we’d avoid these at all costs. You might not expect a family SUV to handle particularly well, but there are cars in this class that do – namely the Seat Ateca and Skoda Karoq. 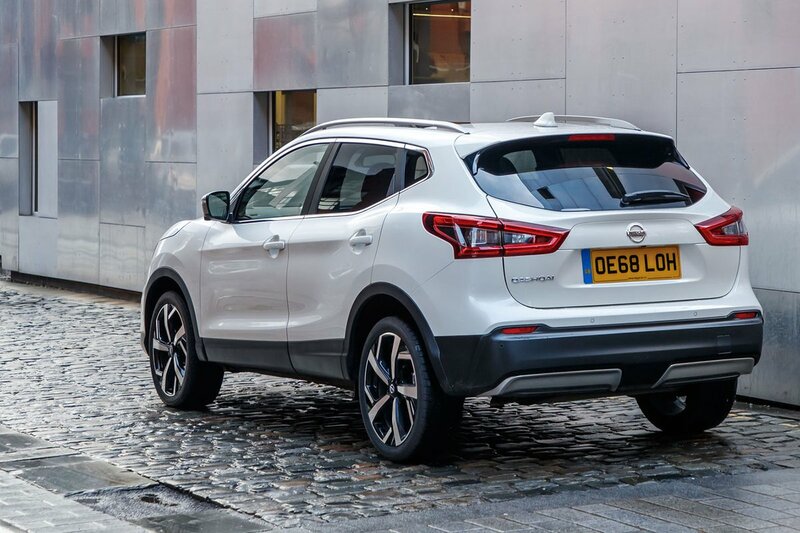 The Qashqai is a bit softer by comparison, with plenty of body lean in bends and slightly vague steering that doesn’t communicate about the grip that's available, making it less fun for keen drivers. That said, for everyone else, the Qashqai is safe and secure along a twisting country road, thanks to plenty of grip. It’s also light and easy to manage in town. As we mentioned earlier, if you want the extra traction of four-wheel drive, you’ll have to wait for the 1.7-litre diesel to come on stream later this year. The 138bhp 1.3 petrol is a tad gravelly at low revs but still smoother and quieter overall than the equivalent engines in the rival Skoda Karoq and Seat Ateca. The 1.5-litre diesel, meanwhile, is remarkably hushed – even when you’re working it hard. However, there’s plenty of suspension noise to spoil the peace along rough roads. Opt for 18in or larger wheels and the Qashqai also generates noticeable tyre roar at higher speeds, such as on the motorway. Overall, it isn’t as peaceful a cruising companion as the best cars in this class. The dual-clutch auto ’box that’s available on the higher-powered petrol Qashqai is a little jerky at slow speeds but changes very smoothly up and down the gears once you're rolling.